The Alabama Crimson Tide paid a visit to the White House the other day and it turned out to be one of those uniquely American moments. For the record – I happen to be a Tennessee Volunteer fan — but what the Crimson Tide did at the White House transcends football rivalries – even Southeastern Conference football rivalries. Coach Nick Saban gladly accepted President Trump’s invitation and said the entire national championship team would attend– regardless of political proclivities. And that’s exactly what happened. The team captains presented President Trump with a jersey (No. 17) that had his name printed on the back. It was an all-around class act — a reminder of a time when football was about the sportsmanship and not making a political statement. But something else happened during that ceremony — something that has blessed hearts around the nation. On the flight to Washington, D.C., punter JK Scott was listening to a worship song — when he felt compelled to pray for President Trump. And that’s exactly what JK did. Click here to listen to Todd’s radio interview with JK. 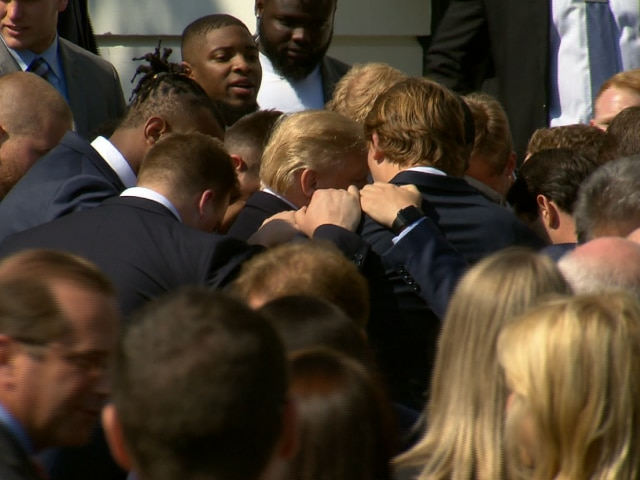 So it was that President Trump stood on the White House lawn surrounded by a mountain of young men dressed in suits, black men and white men, their hands on each other’s backs — interceding on behalf of their president. “Those (were) all my teammates. As soon as President Trump gave us permission, we all laid hands on him and we gathered around and we all started praying,” he said. “The Lord wants to give him some peace,” JK said. Like I said, it was a uniquely American moment.